Maybe even go for a Jack Nicklaus par on a miniature golf course. The Rogue Valley Fun Center, located right off Interstate 5 in Central Point near Medford is a great place to just have unadulterated fun. The 12 acre fun center has everything from batting cages, to a huge arcade, kid go-carts, adult go-carts, miniature golf, bumper boats – seven attractions in all. The fun center looks like an old Western Town, with a doctor’s office, gunsmith and other “shops” but once inside, there is nothing but fun to be had. The facility has great air conditioning, so in the summer when temperatures can hit over 100, it’s a great place to go and cool off while trying the latest video games. Chubb said the fun center tries to have the latest and greatest video games in the arcade, which really do offer something for everyone. From driving, hunting, alien invaders, and even the classic ticket games, the arcade alone could keep you busy for hours. Oh, and I would still be there playing air hockey if it wasn’t for a deadline on this story. All in all there are about 75 different games inside at any one time. But if you want to keep your kids active, and out of the heat, you must have them visit Cactus Jack’s Playhouse. This three-story soft playhouse offers areas for kids to climb, jump, run, and dodge. It even includes punching bags, for those aggressive children and parents. Parents are encouraged to accompany smaller children. Children can be up to 58-inches (4-foot 10-inches) tall to go into the structure. Outside there are a number of activities, and the fun center has an impressive two 18-hole mini-golf course with water features and a castle in the center. There is also an old wagon that people can see. The two race tracks keep little kids entertained, while allowing bigger kids and adults a track of their own to do some serious racing around a separate track with faster Go-Karts. “You can easily spend two to three hours here, and people do spend all day here doing everything,” Chubb said. 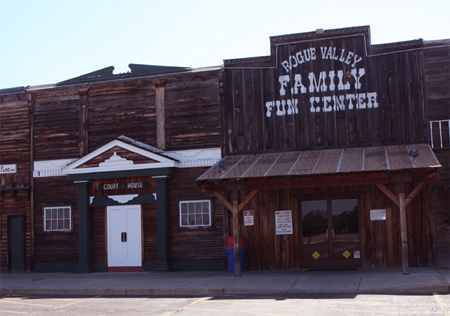 About the Rogue Valley Family Fun Center: A classic fun center that is clean and right along Interstate 5 in Central Point, Oregon. A good place for an afternoon pit stop after a long car ride, or a day-long fun center experience that will keep mom, dad and the kids happy. With seven attractions, snack bar type food, and great air conditioning in the summer, this is a great place to blow off some steam if you find yourself in Southern Oregon. What to bring: With an arcade, it’s always good to wear clothes with pockets, as the tokens need to go someplace. In addition, wear weather-appropriate clothing if you are going to try the Go-Karts, mini-golf or batting cages outside. Tip: The fun center can fill up pretty quickly, so call ahead if you going out of your way to visit. It’s pretty annoying to make a special trip, and then end up spending your day standing in lines. The other thing to consider is that with an all day pass you get a discount, but make sure if you go this route you should get their early. Season: The Rogue Valley Family Fun Center is open year-round, but they do have different hours for different seasons. The best way to find out what the hours are is to call them at 541-664-4263. Getting there: To get to the fun center just type #1A Peninger Road, Central Point, into the GPS, but it is hardly needed. The center is located right off Highway 99, exit 35 from Interstate 5.